Tested the airbed today. It’s comfy! I thought I’d better get it out of the box and inflate it to make sure there are no defects, rather than wait until it’s time to drive to Texas for my Casita. I emptied out the Perfect Tow Vehicle and opened all the doors so there’d be enough light to take a photo for you. There are eight doors on the Perfect Tow Vehicle! The airbed is a Coleman which matches the rechargeable air pump I had already purchased for my inflatable canoe. That’s the canoe in the blue duffel bag. The nozzle fit and the bed and pillow sections inflated nicely. The reviewers said it was difficult to deflate and put back into the attached bag. I didn’t have any trouble at all. Maybe it requires rug-rolling experience — it’s all about the tight roll to start! I spent some time lying on the airbed in the van, dreaming . . . sigh. Until the Georgia heat drove me out. It was in the nineties today. On May 22nd! This former New Yorker is still surprised by Georgia weather. Spring goes by so fast you can get a sunburn picking daffodils. Look at the brown grass in the photo! Anyway. I made a mental note to bring my big oscillating fan on the Texas trip. The canine crew members will be breathing hot air in my face all night, no doubt. I bought some pots and pans today. Over the past six years I haven’t replaced anything that wore out. My pots and pans were getting old. I gave them to Goodwill. No need to replace them because I wasn’t cooking anymore. I thought it would be fun to wait until the time for leaving on my adventure drew near before buying new stuff. 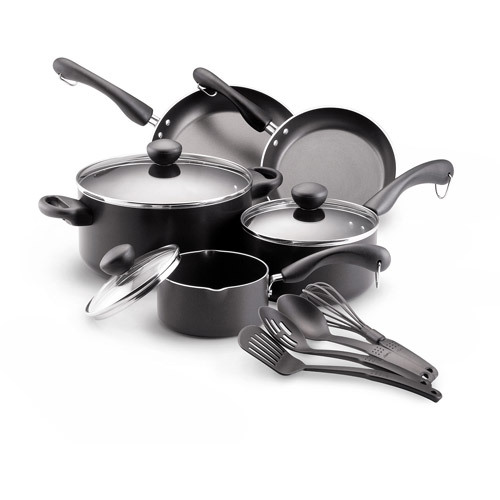 New cookware for a new home! I bought a Farberware set for $44.00. It was on sale from $49.00 at Wal-Mart. I know, I know. It’s a cheap set. Well, it is Farberware and I’ll be cooking only for me so it won’t get much wear and tear. I also picked up some more utensils and a set of flatware. I feel like a young bride setting up house! Note: This day’s post generated some interesting and informative responses. Click on comments to read what other readers had to say. 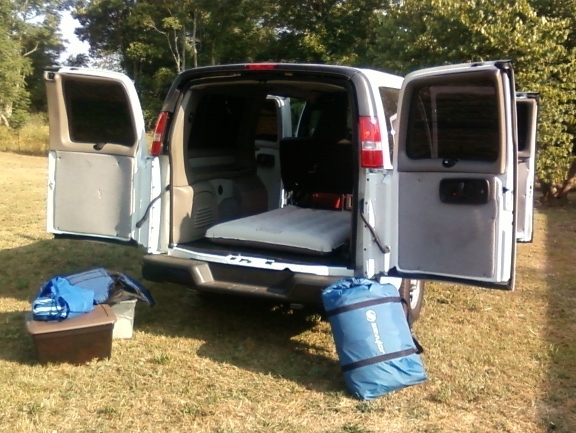 This entry was posted in Simple living and tagged camping, cookware, Farberware, inflatable, Tow vehicle, Travel. Bookmark the permalink. Let’s not get too excited. I’ve got to be careful about those power-sucking appliances. Yes, I am so happy that retirement is only one week away. At long last! I had a terrible time trying to post today. The type kept jumping on top of other type and pictures wouldn’t stay put. It took me forever! I hope it’s wordpress and not my problem. It still needs editing but I’m afraid to touch it. It doesn’t help when Jumbo Kitty decides to walk across the keyboard while I’m typing! I bought a set of pans when I bought my Scamp and after a couple of trips I brought everything in the house except a small sauce pan and a small frying pan + lid. I’ll probably have a yard sale at the campground to get rid of all the stuff I shouldn’t have brought along. It was the cat, darnit. Remember that you won’t have ANY extra room in a Casita. Try not to buy stuff until you actually get the thing. Bill is right about pots and pans… you will use a small skillet, a small pot, and very occasionally have some use for a slightly larger pot to make soup and such. That’s it. Two forks, two knives, two spoons. A can opener, two coffee mugs, a stack of paper plates. A corkscrew. Something to slice with. A tiny trailer is like a haiku. One extra syllable spoils the form. Just enough, though, is a thing of beauty. Airbeds fail, take it from me. Repeatedly. The good news is that you won’t be sleeping on plywood until you reach a Walmart, as I was. Underneath the imprisoned air, you have cushions. You will find shopping simple. Very quickly, in order to add something, you will have to throw something else away. Hope you ordered the large fresh water tank. O, and you still have one dog too many. Bob, too large for a small poem. Um, I don’t know where to begin. You covered a lot of ground! LOL I probably don’t need all those pots and pans. I’m not a kitchen putterer, so I like to cook large for several meals. Thus the big pots. I like the small fry pan for eggs and browning onions, and the large fry pan for stir fry and meal-in-a-pan dishes. All I want the air bed for is car camping from Georgia to Rice, Texas (one night, maybe two). If it dies after that, I don’t care. I plan on getting a memory foam mattress for a permanent bed in the Casita. I did order the large fresh water tank. One dog too many? Shame on you, Bob! How could you think such a thing! It takes at least two to make a crew! Yes, a tiny trailer is a haiku. That’s why I bought my epic poem tow vehicle! My bad, RVSue, I was afraid that in your impatience to proceed you were not fully considering the storage limitations of the Escape Pod. I failed to consider the PTV. And as for the surplus dog, I sit corrected. Crew IS plural. Too bad you can’t just let the air out of them for storage. Bob, who always wanted to be a Pod Person, but eventually grew too large. Sadly, he even outgrew his hair. I can see it airbrushed on the back of the PTV: “noble in aspect, infinite in storage . . .” I’m so pleased you recognize the superiority of the PTV! I ordered the 17-foot Casita Liberty Deluxe. Surplus dog? Let the air out for storage? Great suggestions! LOL Bridget is really not as annoying as I have painted her. Usually. Your post is hilarious. I was trying to be discreet at work, checking comments on the blog, and your post had me laughing out loud (the spelled out way!). I have more, if you are interested. But my own secret plan was a slide out twin on each side which preserved the option of couches, a twin bed and a couch, or a king when they are brought together. The table flips up and latches out of the way. I stole the idea from the arrangement in my Lazy Daze Twin King:. But alas, it was only a eggdream. When it came laying down the cold hard cash, I always went for something bigger. In my case the chicken always showed up before the egg. But I do keep coming back, through the years, to look at the Casita. It appeals to my tinkering instincts. Congratulations. You’ve made a good start. You may have wondered why your comment didn’t show up for days. It was hidden as spam and I just found it today. I clicked on the links — fascinating mods! I enjoyed the photos. There’s a lot of good info for anyone wanting to make twin beds that are “sleepable.” I don’t have the skills needed to fix my Casita like that. I have low-level tinkering skills. I can’t tell you how reassuring it is to have an experienced rver tell me I’ve made a great start with my plans and purchases. I’ve had to operate blind on the Casita purchase. Never have seen the interior of one, let alone the LD model I chose. So thanks for that and for the helpful post for readers and me. I’ve been looking for specific hints on what to do about a mattress. Alert to Casita Owners: You will drool all over your keyboard looking at the modifications shown behind these links! As for tinkering skills, don’t sell yourself short. It is only half inch plywood, sandpaper, and paint, for the most part. You might need a cheap jigsaw for curves and such, but Home Depot will cut up a sheet of plywood in straight lines for just a few pennies a cut. If you can lay it on the floor and draw what you want with a pencil on the plywood, they will cut it up for you. As for the mattress: First, I’d try out the cushions just as they are designed to be used from the factory. If you are not particularly heavy, it might be all you want, and preserves the flexibility of the space. Second, try using your air mattress in there. They are comfortable and cheaply replaced if they leak. They usually lasted me a year or so. Or just try a topper from Walmart. Third, visit a local upholstery supply store. You can get foam in all sorts of densities, you can mix and match and sit or lie on them at the place, and then they can glue and layer various types together and cut it to your exact specifications. You can cover the finished product with a decorative mattress cover from Target or such. I made up one with 4 inches of medium density and two inches of memory foam that I liked, for the overhang of my Class C.
Again,thanks. Wise advice re: mattress. What’s the hurry. Thanks for the details. Very helpful when I eventually want to put together a mattress. One more thing and then I’m done. I used to hate the idea of making up a couch or cushions every night. Too much bother. Then I discovered Ozark Trail flannel sheet sleeping bag liners at Walmart for 10 bucks apiece. They roll up and store as little neck cushions, can be used flat or zippered up like a sleeping bag, and they even zipper together to make extra large sheets. They protect your cushions, and when they get dirty you just throw them in the wash. The really great thing is the way flannel sticks to upholstery. You don’t have to tuck them in to get a flat sheet under you. They don’t move around. Just roll them out and get in, roll them up in the morning and slip the elastic bands sewn into them around the roll. No muss, no fuss, and cheap to replace or clean if the dogs happen to roll in something and then slip by you. :0 Add blankets to taste. A lot easier than making up a bed. Clicked on both URLs. Very nice blog. Very nice. I’m humbled. Now I can only dream that someday I’ll have the experiences to make such interesting posts . . . The flannel sheets have got me thinkin’ I could just get regular flat flannel sheets and attach something elastic at the precise spot needed to hold them in a bolster shape once rolled up. The fact that flannel doesn’t slide is good for keeping dog hair off the cushions. The crew stays pretty clean — they have self-cleaning fur! But they do shed! your blog. Is that this a paid subject or did yoou modify it your self? Either way stay up the nice high quality writing, it is uncommon to lokk a nice blog like this one nowadays..